Before we get started sharing all of the yummy baby shower recipes we have collected, I'd like to share these FREE and cute recipe cards! Scroll to the end of the page to download and print them! We'll also share some cute and clever ways to incorporate them into your baby shower! This is such a delicious salad! And it makes the perfect baby shower recipe! You are sure to get compliments! Mix candy pieces, apples and whipped topping together - that's it! After 1 bite you will never want a "green" salad again. Unroll crescent rolls. Cut each crescent roll into thirds, making medium sized long triangle strips. Take two cocktail wieners each and roll them in the crescent. Do this until all wieners or crescent rolls are gone. Put your complete twin piggies in the oven on a greased cookie sheet on 300 and cook for 10 to 15 minutes or until crescent rolls are brown. If you want you can cut sliced cheese into triangles and add to the twin piggy's for added taste or shredded cheese works well. Great for Twin Baby Showers! Cook pasta shells as directed on the package. Drain and cool. Place remaining ingredients except vinaigrette in a medium bowl. Pour vinaigrette over the salad, toss to coat. 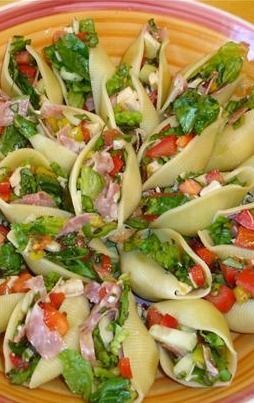 Stuff the shells with the salad. Cover and refrigerate 2 hours before serving. Fast, simple & delicious! Add chicken to sauce and cook for 5-7 minutes on med-low heat until thoroughly coated. Mix chicken mixture into cream cheese until mixed throughly place mixture into baking dish. Cover chicken mixture with blue cheese dressing, add cheddar cheese on top and place in oven for 25-30 min, until bubbly hot. Top with blue cheese crumbles, and serve with celery sticks, fried wontons or crackers. Serves 10-15 people very well. This makes a perfect baby shower appetizer! Thaw the spinach and drain. Put bar of cream cheese in microwavable dish and microwave for about 45 seconds to soften. Mix all ingredients in bowl and put in serving dish. When ready to serve the dip can be microwaved for 3-5 minutes or baked in the oven for 15-20 minutes. This recipe is great to serve with tortilla chips or veggies. Also it is easily doubled for larger parties. This one was a hit - and I made up my own recipe! Cut the top of the loaf of bread and pull out the inside of the bread and use that for dipping. Mix together all the other ingredients and then put in center of bread buy some bread sticks as well and put on the side for dipping as well. A very easy recipe and everyone will love it I promise you! Arrange in an ungreased baking dish. Melt butter and then add 4 oz. blue cheese. Pour over biscuits coating well. Bake 12 to 15 minutes at 375 degrees. Let cool, pull apart and serve ... THESE ARE FABULOUS! My mom would make these maybe twice a year, but they are so good. I actually came across the recipe a couple months ago on the website at: http://www.recipezaar.com/ the only difference is the onion soup mix, we would use any kind it doesn't matter, and it was only 2 envelopes not the additional 1/2. Mix 1-2 cup fine dry breadcrumbs Brown ground beef in a large skillet. Melt 1/2 cup margarine in a separate saucepan over medium heat. Add 2 T. flour, stirring to incorporate. Add dry onion soup mixes and water to make a thick gravy. Bring to boil. Pour gravy over browned beef and simmer for about 1 hour. Add fine dry bread crumbs just enough so mixture hold together. Do this just before you start forming your meat buns. In a mixing bowl mix the warm water, sugar and yeast. Warm the milk, margarine and lard in the Microwave about 3 - 4 minutes, until marg and lard have melted. Add to yeast mixture, and add about 8 cups of flour. Allow this to proof, then add salt, egg and remaining flour, just enough to make a soft dough, and kneed the dough. Place dough in a large bowl. Let rise 10 - 15 minutes. Form meat buns by pinching off pieces of dough the size of a walnut. Flatten the dough in your palm of hand and put about 1 tsp. filling on the dough. Pinch dough around the filling to seal well. Place on baking sheets and let rise. You can often starting baking the first pans before you are finished panning the remaining ones. Bake at 400 deg. for 10 - 12 minutes or golden brown. Combine all ingredients. Top with grated cheese. Bake @ 325 degrees for 30 minutes. Serve with chips or crackers. This is not my recipe but I was told I could share with Cutest Baby Shower Ideas. It gets great reviews at parties. Heat the oil in large stock pot. Add the onion and garlic and cook until soft but not browned. Add sausage and cook completely. Add everything but the frozen green beans and frozen tortellini (ravioli) and simmer for 45 minutes. Then add the frozen beans and frozen tortellini and cook until beans heated through and tortellini is cooked. Top with fresh grated Parmesan. These are wonderful! Especially for green olive lovers! Pat olives with paper towels to dry thoroughly. Cut butter and cheese into flour. Add salt. Form into small balls around olives; seal well. Chill overnight in the refrigerator. Bake at 400° for about 15 minutes or until browned. Makes around 50 cheese puffs. Sift together the flour, salt, and dry mustard. Cut in shortening until mixture resembles meal. Sprinkle 3 tablespoons of water over and stir with a fork until flour is moistened and forms a ball. Add more water if needed. Turn dough out onto a floured surface or parchment paper. Roll into a 1/4 inch thick rectangle. Sprinkle half of the dough surface with 1/3 cup of shredded cheese. Fold the dough over and pinch the edges to seal. Roll out the same dough into a rectangle again and sprinkle half with another 1/3 cup shredded cheese Repeat this process one more time. Then, roll into a rectangle 1/4-inch thick and cut into 3-inch strips. Place cheese straws onto a baking sheet lined with parchment paper and bake at 425° for 10 to 12 minutes, until golden brown. These crock pot pork strips are cooked in barbecue sauce with pineapple and are delicious. In a large skillet, brown pork strips in the olive oil. Add the remaining ingredients to the slow cooker and stir. Stir in browned pork strips. Guests can scoop out directly from the crockpot. Place the chicken, lemon pepper & chicken broth in slow cooker. Make sure chicken is covered by chicken broth. Add more broth until chicken is covered - you don’t want your chicken to dry out. Remove chicken breasts from the broth (leave broth in slow cooker) and allow chicken to cool long enough to be handled. While chicken is cooling in a sauce pan add oil, garlic and onion saute over low heat until onion is soft then add flour stir together and remove from heat and set aside. Shred chicken and add to onion/garlic/flour mixture toss together and add back into the broth in the slow cooker also add the chili powder, cumin, hot sauce, Worcestershire sauce, beans, corn, Velveeta cheese and diced tomatoes in the slow cooker and continue cooking for 2 hours, stirring occasionally. Serve topped with shredded Cheddar cheese, a dollop of sour cream, and tortilla chips strips, if desired. So easy and fast - perfect for those in a hurry! Mix all together and pour into a greased loaf pan, or bunt pan and cook on 350F for 30 minutes. Cook time varies by oven, check after 15 minutes and determine remaining time. 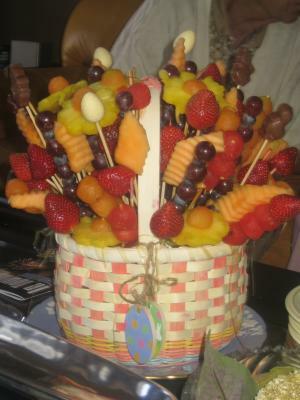 You can make these at any size you'd like, with whatever fruit you would like. For mine I used Pineapple, strawberries, grapes, blueberries, cantaloupe and watermelon. You will need a basket or deep glass dish of some sort, green flower foam and wooden skewers. Cut the pineapple into slices and with a flower shaped cookie cutter make cut outs. Ball watermelon and cantaloupe, and cut the leaves off the strawberries. Next put a skewers into the middle of all the pineapple, and add half a cantaloupe ball to the middle of each of the flowers. Put grapes and blueberries back and forth on a skewer. Ball three watermelon onto each skewers, and put one strawberry on a skewer. Make sure you can not see the top of the skewers. You do not have to follow my directions, you can experiment with your own thoughts and ideas. Place the green flower foam into the bottom of the basket/dish, but wrap it in plastic wrap first so it does not get all over the fruit. Next place the skewers in the foam, starting with the middle/top. Then work out to make the fruit look like a large flower basket. Mix all ingredients together, except crescent rolls, until mixed. Open and unroll crescent rolls. Arrange dough into a circle (triangle shape should have the point at the top) on a round stone or baking pan. Spoon mix into the center of dough. From the point, fold dough, and tuck under flat side. Do this all the way around and tuck any left over dough sticking out. Bake at 350 for 25-30. It depends on if you use a stone pan or regular. Let cool, and serve. Really good as leftovers. Combine first 13 ingredients (all ingredients for meat spread) in food processor. Process until of desired consistency - smooth enough to spread. Divide into thirds, and spread on three slices of the de-crusted bread. Place shaved raw fresh carrot and thin pickle slices on top of meat spread. Cut into appetizer-sized finger sandwiches (4 from each large sandwich), using small baby-themed cutter-shapes. Set each sandwich on a small leaf of lettuce, and arrange on a serving plate. Place halved grape tomatoes in-between finger sandwiches. Use cake-decorating tube and tip to squeeze a little sour cream onto each grape tomato half. And, finally, sprinkle sandwiches and grape tomatoes with fresh parsley. ENJOY! 1. In a large bowl, thoroughly mix kiwis, apples, raspberries, strawberries, white sugar, brown sugar and fruit preserves. Cover and chill in the refrigerator at least 30 minutes. 3. Coat both sides of each flour tortilla with butter flavored cooking spray. Cut into wedges and arrange in a single layer on a large baking sheet. Sprinkle wedges with desired amount of cinnamon sugar. Spray again with cooking spray. 4. Bake in the preheated oven 8 to 10 minutes. Repeat with any remaining tortilla wedges. Allow to cool approximately 15 minutes. Serve with chilled fruit mixture. Leftover chips can be stored in an airtight container. These are as easy as they are adorable! They are always a hit especially at baby showers. 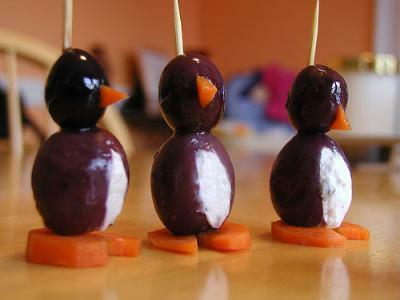 First you will need to fill the penguins' "bellies" with cream cheese. To do so, cut a slit lengthwise down each of the Jumbo olives on one side. Insert cream cheese through the top hole of the olive or through the slit that you just cut. Then you should be able to just pipe the cream cheese right into the olive I use a baby spoon and it works perfecto! Next you make the heads. Take the small olives put them on their sides and insert the small carrot triangles that you cut out in the previous steps right into the olive. They should go in easily and be stay secure in the olive. If need to, cut down the pieces so they fit better. Now you get to assemble your penguin, the easiest way is to start from top to bottom. Take your toothpick and insert it into your penguin "heads" with their beaks facing outwards. Insert your penguins body onto the toothpick with the open cream cheese section facing outwards as well, and then stick on your feet. These little guys are almost too cute to eat! out of cheese, or little snow hills out of dip or even a pool of blue jello to display them on. Cut the jalapenos, pineapple and onion into 1 inch pieces and skewer. Salt and pepper your tomatoes and wrap in foil. Place all ingredients on the grill until the skewered fruit and vegetables have nice grill marks, approximately 15-20 minutes. Allow all ingredients to cool for at least 20 minutes, they place in a blender and blend. Serve with tortilla chips or bread. It is best served chilled. Delicious and versatile. You can use it on many different things. Open the can of Crescent Rolls immediately after removing from the refrigerator and un-roll the dough. The dough will be perforated into triangles (the normal size can has 8 triangles). Working quickly, cut each triangle in half, basically making 16 smaller triangles. Put a dollop of basil pesto in the center of each triangle, then fold all 3 corners into the center, making it look roughly like a diaper. Bake at the temperature recommended on the crescent roll package, but for a few minutes less (since they are smaller). Great when served warm or even if they've sat for a while. Mix the cream cheese with the package of crushed Oreo's and blend until the cream cheese is completely blended in. Stick the mixture in the freezer for two hours. After it is hard, roll into balls and dip in the melted chocolate. Put each ball on wax paper until it hardens. Keep cold. For a baby shower, you can always put some food coloring in the white chocolate so that it is blue or pink. I also buy a pack of milk chocolate so i can decorate the top to make it look better. cut cheddar cheese into cubes and then poke pretzel sticks into the cheese. This is a super easy recipe my sister-in-law makes for many family functions.The kiddos love it. For the shower I'm going to place them on a cute pink plate and add a sign saying "Baby Rattles" Next to the rattles will be a yummy and colorful fruit tray and chocolate dip with a sign saying "Sweet as a Newborn Baby" - you can also place the fruit onto skewers for easy eating. The cake I am making is two rounds of funfetti mix with whipped cream icing. I am going to separate the whipped cream and color half blue then mix them, ice the cake, and surround the cake with long, round, piroline cookies to make it look like a bath tub. Two rubber duckies will float on top. The punch is going to be a blue pina colada mix with a rubber ducky floating on top of it as well. With a sharp knife, cut a thin slice from bottom of melon it sits flat. Take a sharpie and draw the outline that you're going to cut. Take a knife or toothpick and puncture holes into the bottom layer to create the weep holes for the watermelon juice. Use a knife to cut the shape of the carriage hood and sides. You will not need to cut in very deep because the skin is so thin. The sides of the carriage will be slightly under the halfway mark of the watermelon. You can create a carriage handle out of the portion of the shell you cut out. 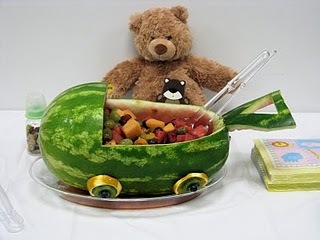 Scoop out the watermelon in the "baby carriage" and transfer it into another container. Place the watermelon carriage on the serving dish. Mix the watermelon with other fruit to create a fruit salad. Create the wheels for your watermelon using oranges. Slice the oranges anywhere between 1/2 inch to an inch thick. Attach the wheels to the watermelon using toothpicks. To create the hubcap you can use Kiwi and blueberry. Everyone has a favorite baby shower recipe that they love to make! So put your creative hats on and submit the tastiest recipe(s) you can cook up! You can share as many recipes as you'd like. Just make sure to make them all separate submissions - only original recipes will be accepted (meaning, recipes must not already be listed on cutest-baby-shower-ideas.com). Important: Try to make your baby shower recipes unique by putting your own creative spin on it. If your recipe was taken from a cookbook or website, please include the source you obtained it from. To add a bit a pizzazz to the baby shower, be sure to include table tents, also known as food labels (these are cute little signs letting guests know what the names of each food dish.) We designed some FREE table tents for you that come in an array of colors! 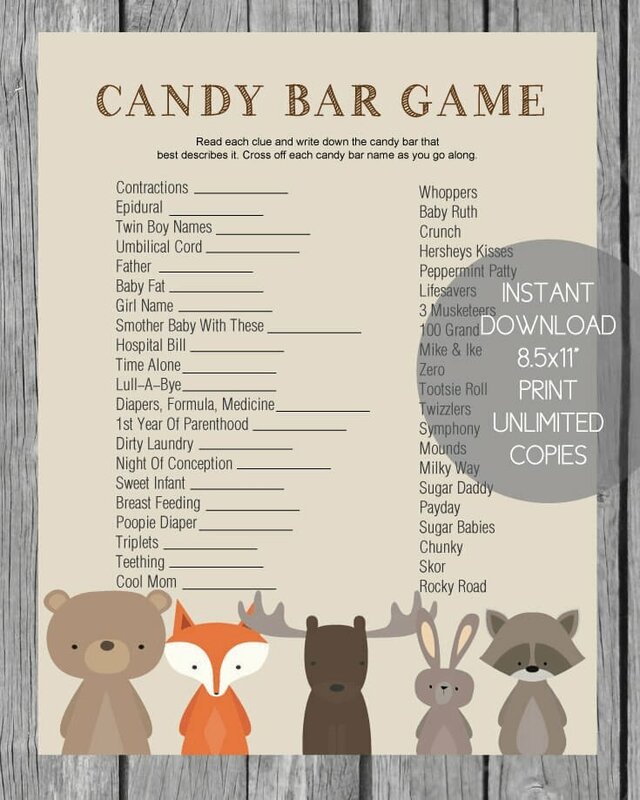 You can download and print them by visiting our Baby Shower Appetizers Page. We have also designed some great Shower Recipe Cards! 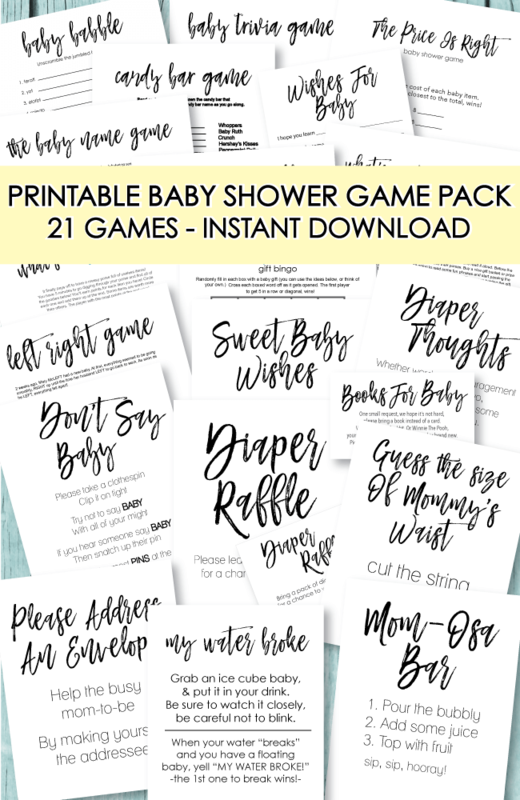 They are FREE to you and are perfect to use for favors (hand out cute bundles of cookies and include the recipe) or send the recipe cards with the baby shower invitation and have guests bring their favorite "easy-to-make" recipes for the mom-to-be! Grab your FREE recipe cards here! Return from Baby Shower Recipes..